‘Hi Andy…hope you are well. We are back from honeymoon alive!! 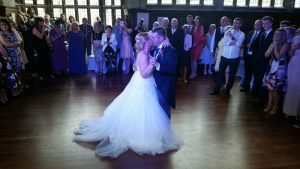 We wanted to say thank you for providing all the music for our wedding at Hoghton Tower on 16th July. We had the most magical day which have left us with some amazing memories, one of which was the Sweet Caroline moment!!! 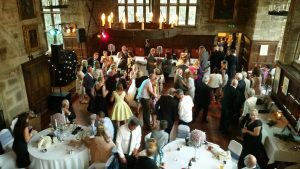 Lots of people have commented on how good the music was throughout…that was shown by how the dance floor was never empty!! Again thank you…and if you took any photos or videos could you possibly send us a copy? Hoghton Tower, a Grade I listed building, is the ancestral home of the de Hoghton family. Over the centuries many royal guests have been welcomed and entertained here including James I, William III, George V & Queen Mary, and Prince Philip, Duke of Edinburgh. Other distinguished visitors include William Shakespeare, JMW Turner and Charles Dickens. All making a truly unique setting for a wedding celebration! Congratulations to Julia & Keith!